Strapack's JK-5 has been improved considerably and transformed into the JK5000 with the same affordability. This Strapack machine carries a standard power supply of 110V Single Phase with optional equipment such as a roller table and foot switch available for an additional cost. The JK-5000 can achieve up to 37 straps/minute, while maintaining all the benefits of the JK-5 such as 110 Volt power supply, parts and labor free strap width adjustment from 5mm to 5/8", auto re-feed, loop ejection and small footprint. This improved strapping machine is jam resistant and allows for easy maintenance. The JK-5000 has a strap width adjustment from 1/4" to 1/2" without the need for any additional parts, allowing for an easy strap width conversion. 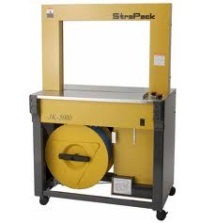 The high quality Strapack JK-5000 comes with a 6 month warranty and guarantees great results. Boatman Marking has a full line of Strapack strapping machines and strapping equipment to fit your individual packaging needs.